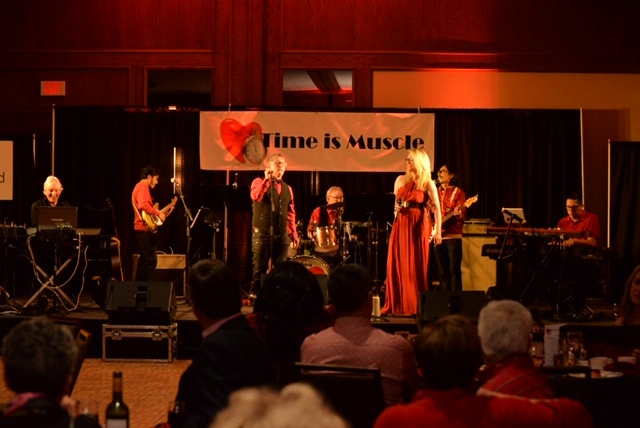 The second annual Time Is Muscle event was a full house (approximately 300 people) and a sea of red – a color worn in solidarity for the cause in a fun and relaxed atmosphere. $54,000 was generously donated in the form of silent auction items to raise funds in addition to a 50-50 and vacation raffle. An awareness video entitled “It’s About Time” by Harley Hay Studios emphasized the need for a Cardiac Catheterization Lab and Red Deer Hospital expansion. The issue was well described on the video by patients, family members, physicians and concerned community members. The Heartbeats Band produced by Harley Hay and Dave Parfett rocked the night away with songs each containing heart in the title from each era, accompanied by a video montage of images and icons of those periods. The Sheraton Red Deer hotel served a delicious heart themed meal. The H’Art gallery featured 16 local artists and over 160 pieces of various mediums including paintings (three of which were live), photography, ceramics, glassworks, jewelry, and wearable art. Guests goofed around inside the fun photo living room. A memory wall was erected in honour of those who have passed from cardiovascular disease by way of photos and name cards.